You might be travelling down from Sydney for the weekend, or travelling the Sydney to Melbourne route. Whatever the case, there is some spectacular coastal scenery to see on the way. Why not check out Grand Pacific Drive. The drive starts at the southern part of Sydney near Sutherland. Take the exit (Farnell Avenue) into the Royal National Park. Continue east and south through through the National Park, with some great lookouts, bush drives, and walks if you’ve got the time. 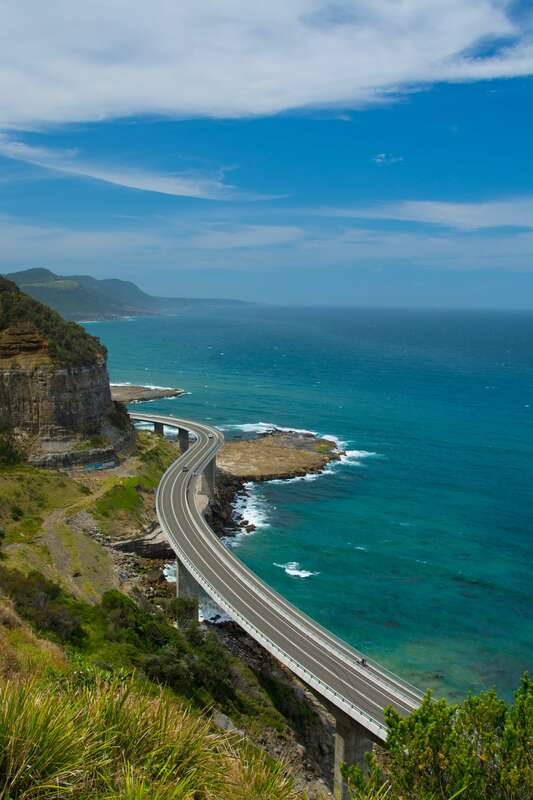 Continue down to Stanwell Park’s Bald Hill Lookout, and then on to the Sea Cliff Bridge – an impressive bridge which hug’s the cliff face it is as good to walk as it is to drive. As you drive down through the northern suburbs of Wollongong, there are some great eateries. I’d recommend getting back on the A1 at Wollongong, but there is some nice coastal scenery through Wollongong and Shellharbour if you’ve got the time. One place that is not well known is Bombo Quarry (near Kiama) – it’s a photographers dream with the unusual rock formations. The Blowhole at Kiama is always worth a visit – especially if the swell is coming in from the southeast when it is at its best. After Kiama, take the Gerrigong exit which will line you up for Seven Mile Beach. All this driving can get a bit thirsty, at the bottom end of Seven Mile are some nice wineries including Mountain Ridge, Coolangatta, and Two Figs. We like Two Figs with the great views over the lower estuaries of the Shoalhaven and Crookhaven Rivers. And they make nice wines too! Not far to go now – into Nowra, cross the river, left on Kalander Road and go straight through the farming countryside for about 12 kilometres to the Anchor Bay Motel. Time to try a glass of the wine since you only had a sip at the winery, right? Overall, this scenic detour adds about an hour to the drive time with some great coastal scenery. 6 stitch panorama of the Bombo Quarry. Nikon D7100 with Nikkor 24:120mm @35mm. "Short Stay at Greenwell Point"
We found this motel to be quiet and peaceful within easy walking distance to the hotel, wharf and cafes. The room was very clean with plenty of space and a view to the water. The manager was friendly and helpful, suggesting things to see and do in the area and places to eat. We would throughly recommend this motel and will stay there next time we are in the Nowra area.